The Z-tron IV™ Point Level RF Switch is a reliable low-cost, on/off level switch. The low-cost, Drexelbrook Z-tron IV level switch is unaffected by sticky coatings and impervious to corrosive liquids. The all-electronic design means no moving parts to wear, break or fail. Based on field-proven RF technology, the Z-tron IV is a simple and reliable on/off level switch. The compact one-piece unit is inserted through a standard 3/4-inch , probe dependent, NPT opening into the vessel so that the sensing element is positioned at the desired high or low level. (Other connection types and sizes are also available.) When the material level reaches a predetermined point on the sensing element, it causes a change in status at the electronic unit, resulting in actuation of the DPDT relay. The relay can be used to operate alarms, annunciators, valves, or other control or indication devices. Effective, low-cost material level detection in a wide variety of applications, and a desirable alternative to electromechanical level switches. No expendable parts to buy and stock. No expensive, extra-cost options. Unlike paddle wheels, vibrating tines or other mechanical instruments, there are no components to jam, break or wear out. No need for routine maintenance, cleaning or replacing of worn parts. Cote-Shield™ circuitry allows the Z-tron IV to ignore coatings or build up on the sensing element. There are no false signals from dust or tunneling. 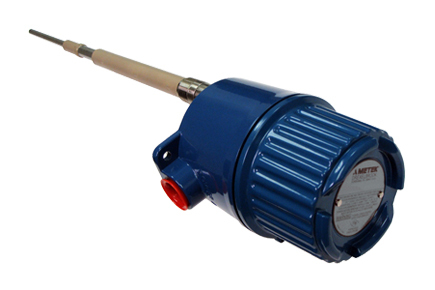 One-piece unit is easily installed through a single 3/4-inch, probe dependent vessel opening. Calibration is quick and simple. Cote-Shield enables the Z-tron IV to ignore dust pileups, coatings, and sticky buildups on the sensing element.